UDIMagic v3.0 Release 1.67 supports "Batch Processing". In simple words, it allows you to "Import of data from multiple Excel sheets" in one-go. Before going into the details of this feature, let's have a look at the Auto-Run feature of UDI-Magic which was introduced some-time back (UDIMagic v3.0 Release 1.60). The Auto-Run feature allows import of data into Tally without any user-intervention. The auto-run status report is generated in autorun.txt file. With the Auto-Run and Batch-Processing features, you can automate your tasks. In simple words, you can schedule UDIMagic in such a way that it automatically runs at a specified time (daily or weekly...) and imports data from one or more Excel (CSV) sheets into Tally. Example 1 : Transform Sales vouchers as "Branch Sales"
Assuming that at your Branch Office, "Sales" vouchers are entered. Your requirement is that when the Branch-data is imported into the Head Office Tally, it must be imported as "Branch Sales" vouchers. At you Branch-Office, various type of entries like "Sales", "Receipt", "Payment" etc are done in Tally. You need to import the Branch-Office data in your Head-Office Tally, but only the "Sales" entries are to be imported, that too as "Branch Sales". 1) We have listed some examples of data transformation. 2) UDIMagic [Professional] provides two features viz Tally-to-Tally and Branch-to-HO which support Data-transformation. 3) Almost all-types of Data-transformation can be done. I am using UDI-Magic to import data into Tally. Even though I have started Tally and opened one Company, UDI-Magic still shows error message "No company is opened in Tally". How do I solve this problem ? 1) Close the Tally Software. 3) Next select "Task Manager"
4) Next, search for Tally9.exe (or Tally72.exe under processes-tab) and click on the End-Process button to close it. 5) Next, search for TallyLicServer.exe (under processes-tab) and click on the End-Process button to close it. 6) Next, start Tally Software and open your Company. 7) Run UDI-Magic and try importing data in Tally Software. Re-start the Computer afterwards so that workstations can access the Tally-license Server which we had terminated manually. "How is the mapping of Excel sheet cells done with the Tally fields ?" UDIMagic uses XML tags for mapping Excel Sheet cells with the Tally fields. The XML tags can be written using any text-editor like NOTEPAD. 2) In a separate file with extension XML. For those who are totally new to XML, initially it may be difficult to digest all these things. But then, it is not very difficult. There is one more tutorial which covers the basics of "Writing XML tags" with step-by-step Instructions. PS: End-users need not worry about learning XML tags to use UDIMagic. Shweta Softwares provides the XML tags. Refer www.rtslink.com/orderinfo.html for more information. You can open XML files in IE (Internet Explorer) or any other browser. However, to edit it you must use a Text-editor or XML-editor. This Post provides Tally-to-Tally Rules for converting Sales vouchers to Purchase. What is Tally to Tally ? UDIMagic v3.0 [Professional] comes with a feature called Tally-to-Tally that allows you to transform Tally data. As the name suggests, the Tally-to-Tally feature allows you to retrieve data from one Tally Company; apply transformation rules; and then send it to another Tally Company. I am having X records (say 10,000 records) in my Excel Sheet. I am using the licensed version of UDI Magic. However, UDI Magic processes only few records (say 100 records). What could be the reason ? It is likely that your Excel Sheet has a BLANK-ROW or HIDDEN-ROW at or near the ROW-number 100 in the Excel Sheet. Remove that and try again. It should work. 1) UDI Magic stops processing if it finds a BLANK-ROW or a HIDDEN-ROW. 2) If you are using DEMO version of UDI Magic, then only 5 or 10 records (Vouchers and Masters resp.) shall be processed. UDIMagic v3.0 Release 1.62 allows you to transform (Branch office) data before importing it into Head-Office Tally Accounting Software. Assuming, you have a Branch Office wherein Accounting is done in Tally. Here, at the Branch Office, only SALES vouchers entries are done. Now, you need to transfer the Branch Office data to Head-Office. At the Head-Office, you need to maintain consolidated data and hence will be importing the Branch-office data into the Head-Office (Tally). However, you want that the SALES vouchers (of Branch Office) be transformed/renamed as "BRANCH SALES" and then the same to be imported into the Head-Office Tally. In simple words, this allows you to have TWO different Sales Voucher-types. i.e. one for Head-Office Sales and another for Branch-Office sales (BRANCH SALES voucher-type). UDIMagic v3.0 Release 1.62 allows you to apply transformation rules to the Branch Office data before importing it at Head-Office. This allows you to do almost anything as per your requirement. Support for writing transformation rules is available to UDIMagic [Professional version] users only. 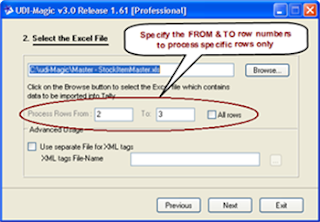 allows you to import specific rows from MS-Excel into Tally Software. To import part-data, you need to specify the FROM and TO rows. By default, all rows are processed by UDIMagic. However, UDIMagic stops processing when it finds a BLANK row or a HIDDEN row. I am trying to import Vouchers into Tally Software using UDI-Magic Software. Though UDI-Magic shows no errors still no data is imported into Tally and the Tally screen (calculator panel) shows error "Cant' Import. Please check Tally.imp file"
The above error generally appears if you are using the Tally Demo (Educational) version and the Vouchers in the Excel Sheet have DATE's other than 1st or 2nd (of any month). The Educational version of Tally accepts Vouchers for the 1st and 2nd of each month. i.e. You cannot import Vouchers having date other than the 1st or 2nd of any month.